The Seahawks made the switch from a Marshawn Lynch-centric offense to a Russell Wilson-centric offense this season. After struggling out of the gate, the Russell Wilson-Doug Baldwin connection heated up to help Seattle finish the season on a 6-1 tear. That offense was cold: physically, in sub-zero temperatures, and metaphorically, thanks to the Vikings&apos; brutal defense. Despite the Seahawks&apos; struggles, they were down 9-0 and just a miracle play away from coming back in the fourth. 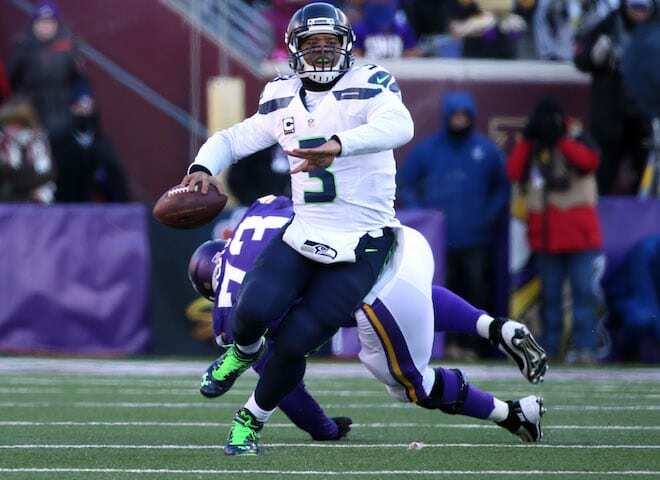 Wilson fumbled a high snap in one play and the surrounding purple spelled certain doom. But behold! Out from despair comes the miracle you see below. Tyler Lockett&apos;s grab put the Seahawks in the red zone, and Baldwin&apos;s subsequent touchdown catch gave them their first points of the game. Seattle hit a field goal to go up 10-9.